If the standard fails, the long measuring probes of the Werth Interferometer Probe WIP enable measurements of tightly toleranced geometrical characteristics. Probe geometry and exit angle can be manufactured for the individual requirements of the measuring task, for example for measurements in deep holes. With conventional optical sensors, narrow and deep features, such as air gaps on electric motors or the roundness of fine injection nozzles, are often not measurable. Laser distance sensors, chromatic focus sensors and confocal sensors fail as a result of the lens’ aperture, and oftentimes the working distance is too small. With the Werth Interferometer Probe (WIP), a highly precise optical fiber sensor is now available that measures via interference. The measuring probe is a light-conducting glass fiber with a standard diameter of 125 µm, smaller probes are available. By guiding the fiber in a metal tube, very long probes can be produced for larger immersion depths. The probe geometry can be manufactured for the individual requirements of the measuring task, for example straight or L-shaped probes are available. The angle of the probe determines the exit angle of the measuring beam between 0° and 90°. Probes with 90° angles are used for the measuring of the circumferential surface of small holes, for example. The WIP/RS provides for a highly precise roundness measurement with a rotating probe. The probe is rotated only through the movement of the highly accurate sensor rotary axis. The user can move the probe from a middle position to an outer position and adjust the desired radius of the cylindrical geometrical element. This functionality allows one to perform roundness measurements with measurement deviations of approx. 100 nm. Alternatively, the probe can be moved during the rotation with the Cartesian axes of the coordinate measuring machine on a circular path to measure larger geometrical features. 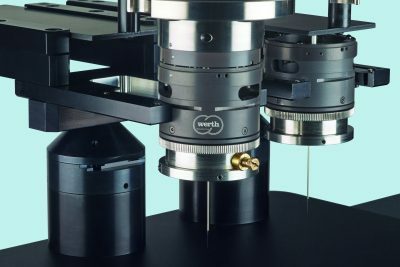 The Werth Interferometer Probe (WIP) provides for measurements with tight tolerances in deep holes and narrow slits with long measuring probes. This functionality provides for the ability to measure a cone seat in a fuel injector nozzle at a depth of more than 10 mm exactly to the sub-micrometer. Another example is the ability to measure the flatness of deep, sensitive bearings in a gear housing. This sensor is also suited for non-contact roughness measurements. In this case, the precision advantage of the process is of particular significance when compared to the triangulation or focus variation processes.